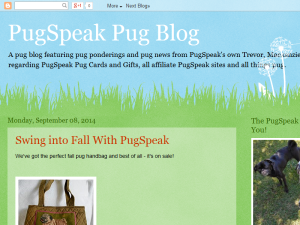 A pug blog featuring pug ponderings and pug news from PugSpeak's own Trevor, Mackenzie, and Zander regarding PugSpeak Pug Cards and Gifts, all affiliate PugSpeak sites and all things pug. This what your PugSpeak Pugs About Town Blog Ad will look like to visitors! Of course you will want to use keywords and ad targeting to get the most out of your ad campaign! So purchase an ad space today before there all gone! There's Still Time and Good Deals Galore! Deck the Halls with Pugs and Hugs! If you are the owner of PugSpeak Pugs About Town, or someone who enjoys this blog why not upgrade it to a Featured Listing or Permanent Listing?